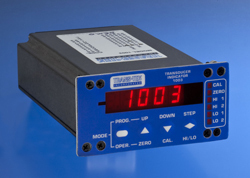 The Model 1003 Transducer Indicator has been specially designed to operate with both DC and AC style LVDTs. It can also be configured to work with our Series 600 & 605 ADTs. This meter features a 5-digit display, high speed analog output, and optional RS232 & relays.